While lemons were originally native to Asia it is believed they were brought to Europe during the time of the Roman Empire and Italian lemons are now considered among the finest in the world. 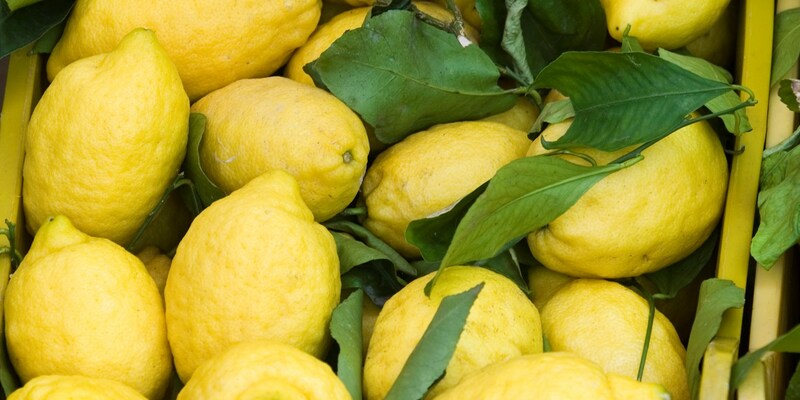 The citrus fruit grows best in the warmer conditions of the south, with Sorrento and the Amalfi Coast particularly regarded for their lemon crops. Lemons are a popular ingredient in Italian cooking, whether squeezed over seafood, whipped into a dessert or served as an ice cold glass of limoncello, the zesty tang of lemon adds a refreshing kick to many classic Italian dishes. Browse this collection of lemon recipes to bring some Italian sunshine into your kitchen. Mauro Uliassi creates a lemon cream base for his Strawberry granita recipe, while Ernesto Iaccarino's 'Concert of lemon flavours' is the ultimate lemon dessert recipe, preparing the fruit in multiple ways to create a lemon caramel, vibrant sugar work, beignets and a creamy lemon custard. On the savoury side Grazia Soncini uses the citrus as a marinade for anchovies in her easy seafood starter, while the Cerea Brothers create a lemon dressing for their Steamed langoustines and mayonnaise.